A major impact event releases the energy of several million nuclear weapons detonating simultaneously, when an asteroid of only a few kilometers in diameter collides with a larger body such as the Earth (image: artist's impression). Impact events appear to have played a significant role in the evolution of the Solar System since its formation. Major impact events have significantly shaped Earth's history, have been implicated in the formation of the Earth–Moon system, the evolutionary history of life, the origin of water on Earth and several mass extinctions. The famous prehistoric Chicxulub impact, 66 million years ago, is believed to be the cause of the Cretaceous–Paleogene extinction event. Throughout recorded history, hundreds of Earth impacts (and exploding bolides) have been reported, with some occurrences causing deaths, injuries, property damage, or other significant localised consequences. One of the best-known recorded events in modern times was the Tunguska event, which occurred in Siberia, Russia, in 1908. The 2013 Chelyabinsk meteor event is the only known such incident in modern times to result in a large number of injuries, excluding the 1490 Ch'ing-yang event in China. The Chelyabinsk meteor is the largest recorded object to have encountered the Earth since the Tunguska event. The Comet Shoemaker–Levy 9 impact provided the first direct observation of an extraterrestrial collision of Solar System objects, when the comet broke apart and collided with Jupiter in July 1994. An extrasolar impact was observed in 2013, when a massive terrestrial planet impact was detected around the star ID8 in the star cluster NGC 2547 by NASA's Spitzer space telescope and confirmed by ground observations. Impact events have been a plot and background element in science fiction. In April 2018, the B612 Foundation reported "It’s 100 per cent certain we’ll be hit [by a devastating asteroid], but we’re not 100 per cent certain when." Also in 2018, physicist Stephen Hawking, in his final book Brief Answers to the Big Questions, considered an asteroid collision to be the biggest threat to the planet. In June 2018, the US National Science and Technology Council warned that America is unprepared for an asteroid impact event, and has developed and released the "National Near-Earth Object Preparedness Strategy Action Plan" to better prepare. According to expert testimony in the United States Congress in 2013, NASA would require at least five years of preparation before a mission to intercept an asteroid could be launched. Major impact events have significantly shaped Earth's history, having been implicated in the formation of the Earth–Moon system, the evolutionary history of life, the origin of water on Earth, and several mass extinctions. Impact structures are the result of impact events on solid objects and, as the dominant landforms on many of the System's solid objects, present the most solid evidence of prehistoric events. 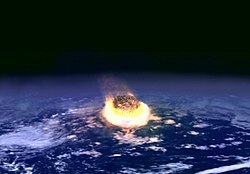 Notable impact events include the Late Heavy Bombardment, which occurred early in history of the Earth–Moon system, and the Chicxulub impact, 66 million years ago, believed to be the cause of the Cretaceous–Paleogene extinction event. Small objects frequently collide with Earth. There is an inverse relationship between the size of the object and the frequency of such events. The lunar cratering record shows that the frequency of impacts decreases as approximately the cube of the resulting crater's diameter, which is on average proportional to the diameter of the impactor. Asteroids with a 1 km (0.62 mi) diameter strike Earth every 500,000 years on average. Large collisions – with 5 km (3 mi) objects – happen approximately once every twenty million years. The last known impact of an object of 10 km (6 mi) or more in diameter was at the Cretaceous–Paleogene extinction event 66 million years ago. The energy released by an impactor depends on diameter, density, velocity, and angle. The diameter of most near-Earth asteroids that have not been studied by radar or infrared can generally only be estimated within about a factor of two based on the asteroid brightness. The density is generally assumed because the diameter and mass are also generally estimates. Due to Earth's escape velocity, the minimum impact velocity is 11 km/s with asteroid impacts averaging around 17 km/s on the Earth. The most probable impact angle is 45 degrees. Impact conditions such as asteroid size and speed, but also density and impact angle determine the kinetic energy released in an impact event. The more energy is released, the more damage is likely to occur on the ground due to the environmental effects triggered by the impact. Such effects can be shock waves, heat radiation, the formation of craters with associated earthquakes, and tsunamis if water bodies are hit. Human populations are vulnerable to these effects if they live within the affected zone. Large seiche waves arising from earthquakes and large-scale deposit of debris can also occur within minutes of impact, thousands of kilometres from impact. Stony asteroids with a diameter of 4 meters (13 ft) enter Earth's atmosphere approximately once per year. Asteroids with a diameter of 7 meters enter the atmosphere about every 5 years with as much kinetic energy as the atomic bomb dropped on Hiroshima (approximately 16 kilotons of TNT), but the air burst is reduced to just 5 kilotons. These ordinarily explode in the upper atmosphere and most or all of the solids are vaporized. However, asteroids with a diameter of 20 m (66 ft), and which strike Earth approximately twice every century, produce more powerful airbursts. The 2013 Chelyabinsk meteor was estimated to be about 20 m in diameter with an airburst of around 500 kilotons, an explosion 30 times the one over Hiroshima. Much larger objects may impact the solid earth and create a crater. Objects with a diameter less than 1 m (3.3 ft) are called meteoroids and seldom make it to the ground to become meteorites. An estimated 500 meteorites reach the surface each year, but only 5 or 6 of these typically create a weather radar signature with a strewn field large enough to be recovered and be made known to scientists. The late Eugene Shoemaker of the U.S. Geological Survey estimated the rate of Earth impacts, concluding that an event about the size of the nuclear weapon that destroyed Hiroshima occurs about once a year. Such events would seem to be spectacularly obvious, but they generally go unnoticed for a number of reasons: the majority of the Earth's surface is covered by water; a good portion of the land surface is uninhabited; and the explosions generally occur at relatively high altitude, resulting in a huge flash and thunderclap but no real damage. Although no human is known to have been killed directly by an impact[disputed – discuss], over 1000 people were injured by the Chelyabinsk meteor airburst event over Russia in 2013. In 2005 it was estimated that the chance of a single person born today dying due to an impact is around 1 in 200,000. The four-meter-sized asteroids 2008 TC3, 2014 AA, 2018 LA, and suspected artificial satellite WT1190F are the only known objects to be detected before impacting the Earth. Impacts have had, during the history of the Earth, a significant geological and climatic influence. The Moon's existence is widely attributed to a huge impact early in Earth's history. Impact events earlier in the history of Earth have been credited with creative as well as destructive events; it has been proposed that impacting comets delivered the Earth's water, and some have suggested that the origins of life may have been influenced by impacting objects by bringing organic chemicals or lifeforms to the Earth's surface, a theory known as exogenesis. 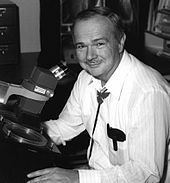 Eugene Merle Shoemaker was first to prove that meteorite impacts have affected the Earth. These modified views of Earth's history did not emerge until relatively recently, chiefly due to a lack of direct observations and the difficulty in recognizing the signs of an Earth impact because of erosion and weathering. Large-scale terrestrial impacts of the sort that produced the Barringer Crater, locally known as Meteor Crater, northeast of Flagstaff, Arizona, are rare. Instead, it was widely thought that cratering was the result of volcanism: the Barringer Crater, for example, was ascribed to a prehistoric volcanic explosion (not an unreasonable hypothesis, given that the volcanic San Francisco Peaks stand only 30 miles (48 km) to the west). Similarly, the craters on the surface of the Moon were ascribed to volcanism. It was not until 1903–1905 that the Barringer Crater was correctly identified as an impact crater, and it was not until as recently as 1963 that research by Eugene Merle Shoemaker conclusively proved this hypothesis. The findings of late 20th-century space exploration and the work of scientists such as Shoemaker demonstrated that impact cratering was by far the most widespread geological process at work on the Solar System's solid bodies. Every surveyed solid body in the Solar System was found to be cratered, and there was no reason to believe that the Earth had somehow escaped bombardment from space. In the last few decades of the 20th century, a large number of highly modified impact craters began to be identified. The first direct observation of a major impact event occurred in 1994: the collision of the comet Shoemaker-Levy 9 with Jupiter. Based on crater formation rates determined from the Earth's closest celestial partner, the Moon, astrogeologists have determined that during the last 600 million years, the Earth has been struck by 60 objects of a diameter of 5 km (3 mi) or more. The smallest of these impactors would leave a crater almost 100 km (60 mi) across. Only three confirmed craters from that time period with that size or greater have been found: Chicxulub, Popigai, and Manicouagan, and all three have been suspected of being linked to extinction events though only Chicxulub, the largest of the three, has been consistently considered. The impact that caused Mistastin crater generated temperatures exceeding 2,370 °C, the highest known to have occurred on the surface of the Earth. Besides direct effect of asteroid impacts on a planet's surface topography, global climate and life, recent studies have shown that several consecutive impacts might have an effect on the dynamo mechanism at a planet's core responsible for maintaining the magnetic field of the planet, and might eventually shut down the planet's magnetic field. While numerous impact craters have been confirmed on land or in the shallow seas over continental shelves, no impact craters in the deep ocean have been widely accepted by the scientific community. Impacts of projectiles as large as one km in diameter are generally thought to explode before reaching the sea floor, but it is unknown what would happen if a much larger impactor struck the deep ocean. The lack of a crater, however, does not mean that an ocean impact would not have dangerous implications for humanity. Some scholars have argued that an impact event in an ocean or sea may create a megatsunami (a giant wave), which can cause destruction both at sea and on land along the coast, but this is disputed. An example of an ocean impact is the large but apparently craterless Eltanin impact into the Pacific Ocean in 2.5 Ma and is thought to involve an object about 1 to 4 kilometres (0.62 to 2.49 mi) across. The effect of impact events on the biosphere has been the subject of scientific debate. Several theories of impact-related mass extinction have been developed. In the past 500 million years there have been five generally accepted major mass extinctions that on average extinguished half of all species. One of the largest mass extinctions to have affected life on Earth was the Permian-Triassic, which ended the Permian period 250 million years ago and killed off 90 percent of all species; life on Earth took 30 million years to recover. The cause of the Permian-Triassic extinction is still a matter of debate; the age and origin of proposed impact craters, i.e. the Bedout High structure, hypothesized to be associated with it are still controversial. The last such mass extinction led to the demise of the dinosaurs and coincided with a large meteorite impact; this is the Cretaceous–Paleogene extinction event (also known as the K–T or K–Pg extinction event), which occurred 66 million years ago. There is no definitive evidence of impacts leading to the three other major mass extinctions. In 1980, physicist Luis Alvarez; his son, geologist Walter Alvarez; and nuclear chemists Frank Asaro and Helen V. Michael from the University of California, Berkeley discovered unusually high concentrations of iridium in a specific layer of rock strata in the Earth's crust. Iridium is an element that is rare on Earth but relatively abundant in many meteorites. From the amount and distribution of iridium present in the 65-million-year-old "iridium layer", the Alvarez team later estimated that an asteroid of 10 to 14 km (6 to 9 mi) must have collided with the earth. This iridium layer at the Cretaceous–Paleogene boundary has been found worldwide at 100 different sites. Multidirectionally shocked quartz (coesite), which is normally associated with large impact events or atomic bomb explosions, has also been found in the same layer at more than 30 sites. Soot and ash at levels tens of thousands times normal levels were found with the above. Anomalies in chromium isotopic ratios found within the K-T boundary layer strongly support the impact theory. Chromium isotopic ratios are homogeneous within the earth, and therefore these isotopic anomalies exclude a volcanic origin, which has also been proposed as a cause for the iridium enrichment. Further, the chromium isotopic ratios measured in the K-T boundary are similar to the chromium isotopic ratios found in carbonaceous chondrites. Thus a probable candidate for the impactor is a carbonaceous asteroid, but a comet is also possible because comets are assumed to consist of material similar to carbonaceous chondrites. Probably the most convincing evidence for a worldwide catastrophe was the discovery of the crater which has since been named Chicxulub Crater. This crater is centered on the Yucatán Peninsula of Mexico and was discovered by Tony Camargo and Glen Pentfield while working as geophysicists for the Mexican oil company PEMEX. What they reported as a circular feature later turned out to be a crater estimated to be 180 km (110 mi) in diameter. This convinced the vast majority of scientists that this extinction resulted from a point event that is most probably an extraterrestrial impact and not from increased volcanism and climate change (which would spread its main effect over a much longer time period). Although there is now general agreement that there was a huge impact at the end of the Cretaceous that led to the iridium enrichment of the K-T boundary layer, remnants have been found of other, smaller impacts, some nearing half the size of the Chicxulub crater, which did not result in any mass extinctions, and there is no clear linkage between an impact and any other incident of mass extinction. Paleontologists David M. Raup and Jack Sepkoski have proposed that an excess of extinction events occurs roughly every 26 million years (though many are relatively minor). This led physicist Richard A. Muller to suggest that these extinctions could be due to a hypothetical companion star to the Sun called Nemesis periodically disrupting the orbits of comets in the Oort cloud, leading to a large increase in the number of comets reaching the inner Solar System where they might hit Earth. Physicist Adrian Melott and paleontologist Richard Bambach have more recently verified the Raup and Sepkoski finding, but argue that it is not consistent with the characteristics expected of a Nemesis-style periodicity. An impact event is commonly seen as a scenario that would bring about the end of civilization. In 2000, Discover Magazine published a list of 20 possible sudden doomsday scenarios with an impact event listed as the most likely to occur. A joint Pew Research Center/Smithsonian survey from April 21–26, 2010 found that 31 percent of Americans believed that an asteroid will collide with Earth by 2050. A majority (61 percent) disagreed. Artist's depiction of a collision between two planetary bodies. Such an impact between the Earth and a Mars-sized object likely formed the Moon. In the early history of the Earth (about four billion years ago), bolide impacts were almost certainly common since the Solar System contained far more discrete bodies than at present. Such impacts could have included strikes by asteroids hundreds of kilometers in diameter, with explosions so powerful that they vaporized all the Earth's oceans. It was not until this heavy bombardment slackened that life appears to have begun to evolve on Earth. The leading theory of the Moon's origin is the giant impact theory, which postulates that Earth was once hit by a planetoid the size of Mars; such a theory is able to explain the size and composition of the Moon, something not done by other theories of lunar formation. Evidence of a massive impact in South Africa near a geological formation known as the Barberton Greenstone Belt was uncovered by scientists in April 2014. They estimated the impact occurred about 3.26 billion years ago and that the impactor was approximately 37–58 kilometers (23–36 miles) wide. The crater from this event, if it still exists, has not yet been found. Two 10-kilometre sized asteroids are now believed to have struck Australia between 360 and 300 million years ago at the Western Warburton and East Warburton Basins creating a 400-kilometre impact zone. According to evidence found in 2015 it is the largest ever recorded. A third, possible impact was also identified in 2015 to the north, on the upper Diamantina River, also believed to have been caused by an asteroid 10 km across about 300 million years ago, but further studies are needed to establish that this crustal anomaly was indeed the result of an impact event. Artifacts recovered with tektites from the 803,000-year-old Australasian strewnfield event in Asia link a Homo erectus population to a significant meteorite impact and its aftermath. Significant examples of Pleistocene impacts include the Lonar crater lake in India, approximately 52,000 years old (though a study published in 2010 gives a much greater age), which now has a flourishing semi-tropical jungle around it. The Rio Cuarto craters in Argentina were produced approximately 10,000 years ago, at the beginning of the Holocene. If proved to be impact craters, they would be the first impact of the holocene. The Campo del Cielo ("Field of Heaven") refers to an area bordering Argentina's Chaco Province where a group of iron meteorites were found, estimated as dating to 4,000–5,000 years ago. It first came to attention of Spanish authorities in 1576; in 2015, police arrested four alleged smugglers trying to steal more than a ton of protected meteorites. The Henbury craters in Australia (~5,000 years old) and Kaali craters in Estonia (~2,700 years old) were apparently produced by objects that broke up before impact. Whitecourt crater in Alberta, Canada is estimated to be between 1,080 and 1,130 years old. The crater is approximately 36 m (118 ft) in diameter and 9 m (30 ft) deep, is heavily forested and was discovered in 2007 when a metal detector revealed fragments of meteoric iron scattered around the area. A Chinese record states that 10,000 people were killed in the 1490 Ch'ing-yang event with the deaths caused by a hail of "falling stones"; some astronomers hypothesize that this may describe an actual meteorite fall, although they find the number of deaths implausible. Kamil Crater, discovered from Google Earth image review in Egypt, 45 m (148 ft) in diameter and 10 m (33 ft) deep, is thought to have been formed less than 3,500 years ago in a then-unpopulated region of western Egypt. It was found February 19, 2009 by V. de Michelle on a Google Earth image of the East Uweinat Desert, Egypt. One of the best-known recorded impacts in modern times was the Tunguska event, which occurred in Siberia, Russia, in 1908. This incident involved an explosion that was probably caused by the airburst of an asteroid or comet 5 to 10 km (3.1 to 6.2 mi) above the Earth's surface, felling an estimated 80 million trees over 2,150 km2 (830 sq mi). In February 1947, another large bolide impacted the Earth in the Sikhote-Alin Mountains, Primorye, Soviet Union. It was during daytime, so was witnessed by many people, which allowed V. G. Fesenkov, then chairman of the meteorite committee of the USSR Academy of Science, to estimate the meteoroid's orbit before it encountered the Earth. Sikhote-Alin is a massive fall with the overall size of the meteoroid estimated at approximately 90,000 kg (200,000 lb). A more recent estimate by Tsvetkov (and others) puts the mass at around 100,000 kg (220,000 lb). It was an iron meteorite belonging to the chemical group IIAB and with a coarse octahedrite structure. More than 70 tonnes (metric tons) of material survived the collision. A case of a human injured by a space rock occurred on November 30, 1954, in Sylacauga, Alabama. There a 4 kg (8.8 lb) stone chondrite crashed through a roof and hit Ann Hodges in her living room after it bounced off her radio. She was badly bruised by the fragments. Several persons have since claimed to have been struck by "meteorites" but no verifiable meteorites have resulted. A small number of meteorite falls have been observed with automated cameras and recovered following calculation of the impact point. The first was the Pribram meteorite, which fell in Czechoslovakia (now the Czech Republic) in 1959. In this case, two cameras used to photograph meteors captured images of the fireball. The images were used both to determine the location of the stones on the ground and, more significantly, to calculate for the first time an accurate orbit for a recovered meteorite. Following the Pribram fall, other nations established automated observing programs aimed at studying infalling meteorites. One of these was the Prairie Meteorite Network, operated by the Smithsonian Astrophysical Observatory from 1963 to 1975 in the midwestern U.S. This program also observed a meteorite fall, the "Lost City" chondrite, allowing its recovery and a calculation of its orbit. Another program in Canada, the Meteorite Observation and Recovery Project, ran from 1971 to 1985. It too recovered a single meteorite, "Innisfree", in 1977. Finally, observations by the European Fireball Network, a descendant of the original Czech program that recovered Pribram, led to the discovery and orbit calculations for the Neuschwanstein meteorite in 2002. On August 10, 1972, a meteor which became known as the 1972 Great Daylight Fireball was witnessed by many people as it moved north over the Rocky Mountains from the U.S. Southwest to Canada. It was filmed by a tourist at the Grand Teton National Park in Wyoming with an 8-millimeter color movie camera. The object was in the range of size from a car to a house and could have ended its life in a Hiroshima-sized blast, but there was never any explosion. Analysis of the trajectory indicated that it never came much lower than 58 km (36 mi) off the ground, and the conclusion was that it had grazed Earth's atmosphere for about 100 seconds, then skipped back out of the atmosphere to return to its orbit around the Sun. Many impact events occur without being observed by anyone on the ground. Between 1975 and 1992, American missile early warning satellites picked up 136 major explosions in the upper atmosphere. In the November 21, 2002, edition of the journal Nature, Peter Brown of the University of Western Ontario reported on his study of U.S. early warning satellite records for the preceding eight years. He identified 300 flashes caused by 1 to 10 m (3 to 33 ft) meteors in that time period and estimated the rate of Tunguska-sized events as once in 400 years. Eugene Shoemaker estimated that an event of such magnitude occurs about once every 300 years, though more recent analyses have suggested he exaggerated by an order of magnitude. In the dark morning hours of January 18, 2000, a fireball exploded over the city of Whitehorse, Yukon Territory at an altitude of about 26 km (16 mi), lighting up the night like day. The meteor that produced the fireball was estimated to be about 4.6 m (15 ft) in diameter, with a weight of 180 tonnes. This blast was also featured on the Science Channel series Killer Asteroids, with several witness reports from residents in Atlin, British Columbia. On 7 June 2006, a meteor was observed striking Reisadalen in Nordreisa municipality in Troms County, Norway. Although initial witness reports stated that the resultant fireball was equivalent to the Hiroshima nuclear explosion, scientific analysis places the force of the blast at anywhere from 100–500 tonnes TNT equivalent, around three percent of Hiroshima's yield. On 15 September 2007, a chondritic meteor crashed near the village of Carancas in southeastern Peru near Lake Titicaca, leaving a water-filled hole and spewing gases across the surrounding area. Many residents became ill, apparently from the noxious gases shortly after the impact. On 7 October 2008, an approximately 4 meter asteroid labeled 2008 TC3 was tracked for 20 hours as it approached Earth and as it fell through the atmosphere and impacted in Sudan. This was the first time an object was detected before it reached the atmosphere and hundreds of pieces of the meteorite were recovered from the Nubian Desert. Trail left by the exploding Chelyabinsk meteor as it passed over the city. On 15 February 2013, an asteroid entered Earth's atmosphere over Russia as a fireball and exploded above the city of Chelyabinsk during its passage through the Ural Mountains region at 09:13 YEKT (03:13 UTC). The object's air burst occurred at an altitude between 30 and 50 km (19 and 31 mi) above the ground, and about 1,500 people were injured, mainly by broken window glass shattered by the shock wave. Two were reported in serious condition; however, there were no fatalities. Initially some 3,000 buildings in six cities across the region were reported damaged due to the explosion's shock wave, a figure which rose to over 7,200 in the following weeks. The Chelyabinsk meteor was estimated to have caused over $30 million in damage. It is the largest recorded object to have encountered the Earth since the 1908 Tunguska event. The meteor is estimated to have an initial diameter of 17–20 metres and a mass of roughly 10,000 tonnes. On 16 October 2013, a team from Ural Federal University led by Victor Grokhovsky recovered a large fragment of the meteor from the bottom of Russia's Lake Chebarkul, about 80 km west of the city. On 1 January 2014, a ~3 meter (10 foot) asteroid, 2014 AA was discovered by the Mount Lemmon Survey and observed over the next hour, and was soon found to be on a collision course with Earth. The exact location was uncertain, constrained to a line between Panama, the central Atlantic Ocean, The Gambia, and Ethiopia. Around roughly the time expected (2 January 3:06 UTC) an infrasound burst was detected near the center of the impact range, in the middle of the Atlantic Ocean. This marks the second time a natural object was identified prior to impacting earth after 2008 TC3. 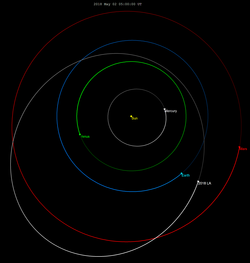 Nearly two years later, on October 3, WT1190F was detected orbiting Earth on a highly eccentric orbit, taking it from well within the Geocentric satellite ring to nearly twice the orbit of the Moon. It was estimated to be perturbed by the Moon onto a collision course with Earth on November 13. With over a month of observations, as well as precovery observations found dating back to 2009, it was found to be far less dense than a natural asteroid should be, suggesting that it was most likely an unidentified artificial satellite. As predicted, it fell over Sri Lanka at 6:18 UTC (11:48 local time). The sky in the region was very overcast, so only an airborne observation team was able to successfully observe it falling above the clouds. It is now thought to be a remnant of the Lunar Prospector mission in 1998, and is the third time any previously unknown object – natural or artificial – was identified prior to impact. On 22 January 2018, an object, A106fgF, was discovered by the Asteroid Terrestrial-impact Last Alert System (ATLAS) and identified as possibly impacting Earth later that day. While a very close approach to Earth was not ruled out entirely, the odds of impact were fairly likely. As it was very dim, and only identified hours before its approach, no more than the initial 4 observations covering a 39-minute period were made of the object. It is unknown if it impacted Earth or not, but no fireball was detected in either infrared or infrasound, so if it did, it would have been very small, and likely near the eastern end of its potential impact area – in the western Pacific Ocean. On 2 June 2018, the Mount Lemmon Survey detected 2018 LA (ZLAF9B2), a small 2-5 meter asteroid which further observations soon found had an 85% chance of impacting Earth. Soon after the impact, a fireball report from Botswana arrived to the American Meteor Society. Further observations with ATLAS extended the observation arc from 1 hour to 4 hours and confirmed that the asteroid orbit indeed impacted Earth in southern Africa, fully closing the loop with the fireball report and making this the third natural object confirmed to impact Earth, and the second on land after 2008 TC3. 8 March 2019, NASA announced the detection of a large airburst that occurred on 18 December 2018 11:48 local time off the eastern coast of the Kamchatka Peninsula. The Kamchatka superbolide is estimated to have had a mass of roughly 1600 tons, and a diameter of 9 to 14 meters depending on its density, making it the third largest asteroid to impact Earth since 1900, after the Chelyabinsk meteor and the Tunguska event. The fireball exploded in an airburst 25.6 kilometres (15.9 mi) above Earth's surface. Orbit and positions of 2018 LA and Earth, 30 days before impact. The diagram illustrates how orbit data can be used to predict impacts well in advance. Note that in this particular instance the asteroid's orbit was not known until a few hours before impact. The diagram was constructed afterwards for illustration. In the late 20th and early 21st century scientists put in place measures to detect Near earth objects, and predict the dates and times of asteroids impacting earth, along with the locations at which they will impact. The International Astronomical Union Minor Planet Center (MPC) is the global clearing house for information on asteroid orbits. NASA's Sentry System continually scans the MPC catalog of known asteroids, analyzing their orbits for any possible future impacts. Currently none are predicted (the single highest probability impact currently listed is ~7 m asteroid 2010 RF12, which is due to pass earth in September 2095 with only a 5% predicted chance of impacting). So far only three impact events have been successfully predicted in advance. 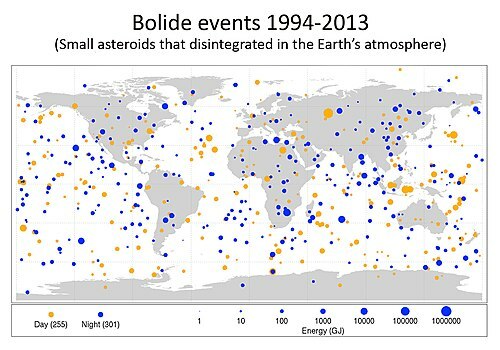 Currently prediction is mainly based on cataloging asteroids years before they are due to impact. This works well for larger asteroids (> 1 km across) as they are easily seen from a long distance. Over 95% of them are already known, so their orbits can be measured and any future impacts predicted long before they are on their final approach to Earth. Smaller objects are too faint to observe except when they come very close and so most can only be observed on final approach. Current mechanisms for detecting asteroids on final approach rely on wide-field ground based telescopes, such as the ATLAS system. However current telescopes only cover part of the Earth and also cannot detect asteroids on the day-side of our planet, which is why so few of the smaller asteroids that commonly impact Earth are detected during the few hours that they would be visible. Ground based telescopes can only detect objects approaching on the night-side of the planet, away from the Sun. Roughly half of impacts occur on the day-side of the planet. Impact craters provide evidence of past impacts on other planets in the Solar System, including possible interplanetary terrestrial impacts. Without carbon dating, other points of reference are used to estimate the timing of these impact events. Mars provides some significant evidence of possible interplanetary collisions. The North Polar Basin on Mars is speculated by some to be evidence for a planet-sized impact on the surface of Mars between 3.8 and 3.9 billion years ago, while Utopia Planitia is the largest confirmed impact and Hellas Planitia is the largest visible crater in the Solar System. The Moon provides similar evidence of massive impacts, with the South Pole–Aitken basin being the biggest. Mercury's Caloris Basin is another example of a crater formed by a massive impact event. Rheasilvia on Vesta is an example of a crater formed by an impact capable of, based on ratio of impact to size, severely deforming a planetary-mass object. Impact craters on the moons of Saturn such as Engelier and Gerin on Iapetus, Mamaldi on Rhea and Odysseus on Tethys and Herschel on Mimas form significant surface features. 2018 models developed to explain the unusual spin of Uranus support a long-held theory that this was caused by an oblique collision with massive object twice the size of Earth. May 2017 event 2017/05/26 19:25 13 +51.2 ? Mar 2016 event 2016/03/17 00:18:33 15 +4 ? Aug 2010 event 2010/08/20 18:22:12 10 +11 ? Jul 1994 Comet Shoemaker–Levy 9 1994/07/16-22 1800 −65 ? On July 1994, Comet Shoemaker–Levy 9 was a comet that broke apart and collided with Jupiter, providing the first direct observation of an extraterrestrial collision of Solar System objects. The event served as a "wake-up call", and astronomers responded by starting programs such as Lincoln Near-Earth Asteroid Research (LINEAR), Near-Earth Asteroid Tracking (NEAT), Lowell Observatory Near-Earth Object Search (LONEOS) and several others which have drastically increased the rate of asteroid discovery. The 2009 Jupiter impact event happened on July 19 when a new black spot about the size of Earth was discovered in Jupiter's southern hemisphere by amateur astronomer Anthony Wesley. Thermal infrared analysis showed it was warm and spectroscopic methods detected ammonia. JPL scientists confirmed that there was another impact event on Jupiter, probably involving a small undiscovered comet or other icy body. The impactor is estimated to have been about 200–500 meters in diameter. A 2010 Jupiter impact event occurred on June 3 involving an object estimated at 8–13 meters was recorded and first reported by Anthony Wesley. On Sept 10, 2012, amateur astronomer Dan Petersen visually detected a fireball on Jupiter that lasted 1 or 2 seconds using a 12″ LX200. It was estimated that the fireball was created by a meteoroid less than 10 meters in diameter. On March 17, 2016, a Jupiter impact event occurred involving an unknown object, possibly a small comet or asteroid initially estimated at 30–90 meters (or a few hundred feet) across. The size estimate was later corrected to 7 and 19 meters. The event was first reported by Austrian amateur astronomer Gerrit Kernbauer, and later confirmed in footage from the telescope of amateur astronomer John McKeon. On May 26, 2017, amateur astronomer Sauveur Pedranghelu observed another flash from Corsica (France). The event was announced the next day, and was quickly confirmed by two German observers, Thomas Riessler and André Fleckstein. The impactor had an estimated size of 4 to 10 meters. 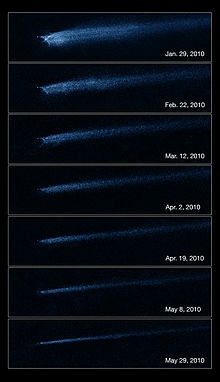 Hubble's Wide Field Camera 3 clearly shows the slow evolution of the debris coming from asteroid P/2010 A2, assumed to be due to a collision with a smaller asteroid. In 2010, between January and May, Hubble's Wide Field Camera 3 took images of an unusual X shape originated in the aftermath of the collision between asteroid P/2010 A2 with a smaller asteroid. Around March 27, 2012, based on evidence, there were signs of an impact on Mars. Images from the Mars Reconnaissance Orbiter provide compelling evidence of the largest impact observed to date on Mars in the form of fresh craters, the largest measuring 48.5 by 43.5 meters. It is estimated to be caused by an impactor 3 to 5 meters long. On March 19, 2013, an impact occurred on the Moon that was visible from Earth, when a boulder-sized 30 cm meteoroid slammed into the lunar surface at 90,000 km/h (56,000 mph) creating a 20-meter crater. NASA has actively monitored lunar impacts since 2005, tracking hundreds of candidate events. Asteroid collision led to the building of planets near star NGC 2547-ID8 (artist concept). Collisions between galaxies, or galaxy mergers, have been observed directly by space telescopes such as Hubble and Spitzer. However, collisions in planetary systems including stellar collisions, while long speculated, have only recently begun to be observed directly. In 2013, an impact between minor planets was detected around the star NGC 2547 ID 8 by Spitzer and confirmed by ground observations. Computer modelling suggests that the impact involved large asteroids or protoplanets similar to the events believed to have led to the formation of terrestrial planets like the Earth. Numerous science fiction stories and novels center around an impact event. One of the first and more popular is Off on a Comet (French: Hector Servadac) by Jules Verne, published in 1877, and H. G. Wells wrote about such an event in his 1897 short story "The Star." In more modern times, possibly the best-selling was the novel Lucifer's Hammer by Larry Niven and Jerry Pournelle. Arthur C. Clarke's novel Rendezvous with Rama opens with a significant asteroid impact in northern Italy in the year 2077 which gives rise to the Spaceguard Project, which later discovers the Rama spacecraft. In 1992 a Congressional study in the U.S. led to NASA being directed to undertake the "Spaceguard Survey", with the novel being named as the inspiration for the name to search for Earth-impacting asteroids. This in turn inspired Clarke's 1993 novel The Hammer of God. 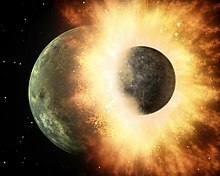 A variation on the traditional impact story was provided by Jack McDevitt's 1999 novel Moonfall, in which a very large comet traveling at interstellar velocities collides with and partially destroys the Moon, fragments of which then collide with the Earth. The 1985 Niven and Pournelle novel Footfall features the examination of the effects of planetary warfare conducted by an alien species that culminates in the use of asteroids to bombard the planet, creating very large craters and the human species' near-extinction. Robert A. Heinlein used the concept of guided meteors in his novel The Moon is a Harsh Mistress, in which Moon rebels use rock-filled shipping containers as a weapon against their Earth oppressors. Some science fiction has concerned itself not with the specifics of the impact event and/or its prevention or avoidance but its secondary effects on human society. Ben H. Winters' 2012 novel The Last Policeman is set six months prior to an asteroid collision, following a murder investigation that is complicated by the political and cultural responses to the impending event. Several disaster films center on actual or threatened impact events. Released during the turbulence of World War I, the Danish feature film The End of the World revolves around the near-miss of a comet which causes fire showers and social unrest in Europe. When Worlds Collide (1951), based on a 1933 novel by Philip Wylie, deals with two planets on a collision course with Earth—the smaller planet a "near miss," causing extensive damage and destruction, followed by a direct hit from the larger planet. Meteor (1979) features small asteroid fragments and a large 8 km (5 mi)-wide asteroid heading for Earth after being wrenched out of orbit by a collision with a comet. Orbiting U.S. and Soviet nuclear weapons platforms are turned away from their respective earthbound targets and toward the incoming threat. The concept for this defense mechanism was taken from a 1968 MIT study called "Project Icarus." In 1998, two films were released in the United States on the subject of attempting to stop impact events: Paramount/DreamWorks' Deep Impact, about a comet, and Touchstone Pictures' Armageddon, about an asteroid. Both involved using Space Shuttle-derived craft to deliver nuclear weapons to destroy their targets. The 2008 American Broadcasting Company's miniseries Impact deals with a splinter of a brown dwarf hidden in a meteor shower which strikes the Moon and sends it on a collision course with Earth. The 2011 film Melancholia uses the motif of an impact event incorporated in the aesthetics of Romanticism. ^ Rumpf, Clemens M.; Lewis, Hugh G.; Atkinson, Peter M. (2017-04-19). "Asteroid impact effects and their immediate hazards for human populations". Geophysical Research Letters. 44 (8): 3433–3440. arXiv:1703.07592. Bibcode:2017GeoRL..44.3433R. doi:10.1002/2017gl073191. ISSN 0094-8276. ^ a b Harper, Paul (28 April 2018). "Earth will be hit by asteroid with 100% CERTAINTY – space experts warn – EXPERTS have warned it is "100pc certain" Earth will be devastated by an asteroid as millions are hurling towards the planet undetected". Daily Star. Retrieved 28 April 2018. ^ a b Homer, Aaron (28 April 2018). "Earth Will Be Hit By An Asteroid With 100 Percent Certainty, Says Space-Watching Group B612 – The group of scientists and former astronauts is devoted to defending the planet from a space apocalypse". Inquisitr. Retrieved 28 April 2018. ^ a b Stanley-Becker, Isaac (15 October 2018). "Stephen Hawking feared race of 'superhumans' able to manipulate their own DNA". The Washington Post. Retrieved 26 November 2018. ^ a b Haldevang, Max de (14 October 2018). "Stephen Hawking left us bold predictions on AI, superhumans, and aliens". Quartz. Retrieved 26 November 2018. ^ a b Bogdan, Dennis (18 June 2018). "Comment - Better Way To Avoid Devastating Asteroids Needed?". The New York Times. Retrieved 26 November 2018. ^ a b Staff (21 June 2018). "National Near-Earth Object Preparedness Strategy Action Plan" (PDF). White House. Retrieved 22 June 2018. ^ a b Mandelbaum, Ryan F. (21 June 2018). "America Isn't Ready to Handle a Catastrophic Asteroid Impact, New Report Warns". Gizmodo. Retrieved 22 June 2018. ^ a b Myhrvold, Nathan (22 May 2018). "An empirical examination of WISE/NEOWISE asteroid analysis and results". Icarus. 314: 64–97. Bibcode:2018Icar..314...64M. doi:10.1016/j.icarus.2018.05.004. Retrieved 22 June 2018. ^ a b Chang, Kenneth (14 June 2018). "Asteroids and Adversaries: Challenging What NASA Knows About Space Rocks - Two years ago, NASA dismissed and mocked an amateur's criticisms of its asteroids database. Now Nathan Myhrvold is back, and his papers have passed peer review". The New York Times. Retrieved 22 June 2018. ^ a b Chang, Kenneth (14 June 2018). "Asteroids and Adversaries: Challenging What NASA Knows About Space Rocks - Relevant Comments". The New York Times. Retrieved 22 June 2018. ^ a b c U.S.Congress (Spring 2013). "Threats From Space: a Review of U.S. Government Efforts to Track and mitigate Asteroids and Meteors (Part I and Part II) – Hearing Before the Committee on Science, Space, and Technology House of Representatives One Hundred Thirteenth Congress First Session" (PDF). United States Congress (Hearings held 19 March 2013 and 10 April 2013). p. 147. Retrieved 3 May 2014. ^ Crater Analysis Techniques Working Group; Arvidson, R. E.; Boyce, J.; Chapman, C.; Cintala, M.; Fulchignoni, M.; Moore, H.; Neukum, G.; Schultz, P.; Soderblom, L.; Strom, R.; Woronow, A.; Young, R. (1979), "Standard Techniques for Presentation and Analysis of Crater Size-Frequency Data", Icarus, 37 (2): 467–474, Bibcode:1979Icar...37..467C, doi:10.1016/0019-1035(79)90009-5, hdl:2060/19780014063. ^ Robert Sanders (February 7, 2013). "New evidence comet or asteroid impact was last straw for dinosaurs". UC Berkeley News Center. Retrieved 2013-02-11. ^ A seismically induced onshore surge deposit at the KPg boundary, North Dakota - Proceedings of the National Academy of Sciences (PNAS) - Robert DePalma et al., published ahead of print 1 April 2019. ^ "The word: Torino scale". New Scientist. 25 October 2005. p. 56. ^ "The First Discovered Asteroid of 2014 Collides With The Earth – An Update". NASA/JPL. 3 January 2014. Retrieved 11 January 2014. ^ Canup, R.; Asphaug, E. (2001). "Origin of the Moon in a giant impact near the end of the Earth's formation" (PDF). Nature. 412 (6848): 708–712. Bibcode:2001Natur.412..708C. doi:10.1038/35089010. PMID 11507633. Archived from the original (PDF) on July 30, 2010. Retrieved 2011-12-10. ^ "Russia's Popigai Meteor Crash Linked to Mass Extinction". June 13, 2014. ^ Dvorsky, George (2017-09-17). "The Hottest Known Temperature On Earth Was Caused By An Ancient Asteroid Strike". Gizmodo. Retrieved 2017-09-17. ^ Dypvik, Henning; Burchell, Mark; Claeys, Philippe. "Impacts into Marine and Icy Environments: A Short Review in Cratering in Marine Environments and on Ice". ^ Gault, D. E.; Sonnet, C. P.; Wedekind, J. A. (1979). "Tsunami Generation by Pelagic Planetoid Impact". Lunar and Planetary Science Conference Abstract. ^ Melosh, H. J. (2003). "Impact-generated tsunamis: An over-rated hazard". Lunar and Planetary Science Conference Abstract. 34: 2013. Bibcode:2003LPI....34.2013M. ^ Hagstrum, Jonathan T. (2005). "Antipodal Hotspots and Bipolar Catastrophes: Were Oceanic Large-body Impacts the Cause?" (PDF). Earth and Planetary Science Letters. 236 (1–2): 13–27. Bibcode:2005E&PSL.236...13H. doi:10.1016/j.epsl.2005.02.020. ^ a b Keller G. (2005). "Impacts, volcanism and mass extinction: random coincidence or cause and effect?" (PDF). Australian Journal of Earth Sciences. 52 (4–5): 725–757. Bibcode:2001AuJES..52..725K. doi:10.1080/08120090500170393. ^ Müller, R.D. ; Goncharov, A.; Kristi, A. (2005). "Geophysical evaluation of the enigmatic Bedout basement high, offshore northwest Australia". Earth and Planetary Science Letters. 237 (1–2): 265–284. Bibcode:2005E&PSL.237..264M. doi:10.1016/j.epsl.2005.06.014. ^ Carter, Elizabeth; Pasek, Matthew; Smith, Tim; Kee, Terence; Hines, Peter; Howell, G. M. Edwards (August 2010). "Rapid Raman mapping of a fulgurite (Paywall)". Analytical and Bioanalytical Chemistry. 397 (7): 2647–58. doi:10.1007/s00216-010-3593-z. PMID 20229006. ^ Shukolyukov, A.; Lugmair, G. W. (1998), "Isotopic Evidence for the Cretaceous-Tertiary Impactor and Its Type", Science, 282 (5390): 927–930, Bibcode:1998Sci...282..927S, doi:10.1126/science.282.5390.927, PMID 9794759. ^ "Twenty ways the world could end suddenly". Discover Magazine. ^ Canup, Robin M. (2004). "Dynamics of Lunar Formation". Annual Review of Astronomy & Astrophysics. 42 (1): 441–475. Bibcode:2004ARA&A..42..441C. doi:10.1146/annurev.astro.41.082201.113457. ^ "Asia's oldest axe tools discovered". BBC News. March 3, 2000. ^ Antón, Susan C.; Swisher, Iii, Carl C. (2004). "Early Dispersals of Homo from Africa". Annual Review of Anthropology. 33: 271–296. doi:10.1146/annurev.anthro.33.070203.144024. ^ "Henbury Meteorites Conservation Reserve". 2018-12-17. ^ Yau, K.; Weissman, P.; Yeomans, D. (1994), "Meteorite Falls in China and Some Related Human Casualty Events", Meteoritics, 29 (6): 864–871, Bibcode:1994Metic..29..864Y, doi:10.1111/j.1945-5100.1994.tb01101.x. ^ Hogenboom, Melissa. "In Siberia in 1908, a huge explosion came out of nowhere". Retrieved 2017-03-30. ^ Gallant, Roy (February 1996). "Sikhote-Alin Revisited". Meteorite Magazine. Archived from the original on 2010-06-12. ^ "Russian Meteor". NASA. Retrieved 15 February 2013. ^ Arutunyan, Anna; Bennetts, Marc (15 February 2013). "Meteor in central Russia injures at least 500". USA Today. Retrieved 15 February 2013. ^ "Meteor falls in Russia, 700 injured by blasts". Associated Press. Retrieved 15 February 2013. ^ Метеоритный дождь над Уралом: пострадали 1200 человек. Vesti (in Russian). RU. 15 February 2013. Retrieved 15 February 2013. ^ Marson, James; Gautam Naik. "Meteorite Hits Russia, Causing Panic". Wall Street Journal. Retrieved 15 February 2013. ^ Ewait, David. "Exploding Meteorite Injures A Thousand People In Russia". Forbes. Retrieved 15 February 2013. ^ Andrey Kuzmin (16 February 2013). "Meteorite explodes over Russia, more than 1,000 injured". Reuters. Retrieved 16 February 2013. ^ "Meteorite-caused emergency situation regime over in Chelyabinsk region". Russia Beyond The Headlines. Rossiyskaya Gazeta. Interfax. 5 March 2013. Retrieved 6 March 2013. ^ "Asteroid impacts – How to avert Armageddon". The Economist. 15 February 2013. Retrieved 16 February 2013. ^ Kenneth Chang (15 February 2013). "Size of Blast and Number of Injuries Are Seen as Rare for a Rock From Space". The New York Times. Retrieved 16 February 2013. ^ Beatty, J. Kelly (February–March 2014). "Russian Fireball Fragment Found". Australian Sky & Telescope. p. 12. ISSN 1832-0457. ^ de la Fuente Marcos, Carlos; de la Fuente Marcos, Raúl (18 June 2018). "On the Pre-impact Orbital Evolution of 2018 LA, Parent Body of the Bright Fireball Observed Over Botswana on 2018 June 2". Research Notes of the AAS. 2 (2): 57. arXiv:1806.05164. Bibcode:2018RNAAS...2b..57D. doi:10.3847/2515-5172/aacc71. ^ de la Fuente Marcos, Carlos; de la Fuente Marcos, Raúl (26 July 2018). "Pre-airburst Orbital Evolution of Earth's Impactor 2018 LA: An Update". Research Notes of the AAS. 2 (3): 131. arXiv:1807.08322. Bibcode:2018RNAAS...2c.131D. doi:10.3847/2515-5172/aad551. ^ de la Fuente Marcos, C.; de la Fuente Marcos, R. (2019). "Waiting to make an impact: A probable excess of near-Earth asteroids in 2018 LA-like orbits". Astronomy and Astrophysics. 621: A137. arXiv:1811.11845. Bibcode:2018arXiv181111845D. doi:10.1051/0004-6361/201834313. ^ "Sentry: Earth Impact Monitoring". Jet Propulsion Laboratory. NASA. Retrieved 25 August 2018. ^ "Update to Determine the Feasibility of Enhancing the Search and Characterization of NEOs" (PDF). Near-Earth Object Science Definition Team Report 2017. NASA. Retrieved 7 July 2018. ^ Johns Hopkins University (4 March 2019). "Asteroids are stronger, harder to destroy than previously thought". Phys.org. Retrieved 4 March 2019. ^ El Mir, Charles; Ramesh, KT; Richardson, Derek C. (15 March 2019). "A new hybrid framework for simulating hypervelocity asteroid impacts and gravitational reaccumulation". Icarus. 321: 1013–1025. doi:10.1016/Icarus.2018.12.032 (inactive 2019-03-14). Retrieved 4 March 2019. ^ Andrews, Robin George (8 March 2019). "If We Blow Up an Asteroid, It Might Put Itself Back Together - Despite what Hollywood tells us, stopping an asteroid from creating an extinction-level event by blowing it up may not work". The New York Times. Retrieved 9 March 2019. ^ Kegerreis, J. A.; Teodoro, L. F. A.; Eke, V. R.; Massey, R. J.; Catling, D. C.; Fryer, C. L.; Korycansky, D. G.; Warren, M. S.; Zahnle, K. J. (2018). "Consequences of Giant Impacts on Early Uranus for Rotation, Internal Structure, Debris, and Atmospheric Erosion". The Astrophysical Journal. 861 (1): 52. arXiv:1803.07083. Bibcode:2018ApJ...861...52K. doi:10.3847/1538-4357/aac725. ISSN 1538-4357. ^ a b c d e f R. Hueso; M. Delcroix; A. Sánchez-Lavega; S. Pedranghelu; G. Kernbauer; J. McKeon; A. Fleckstein; A. Wesley; J.M. Gómez-Forrellad; J.F. Rojas; J. Juaristi (2018). "Small impacts on the giant planet Jupiter". Astronomy & Astrophysics. 309: 277–296. arXiv:1804.02434. Bibcode:2018Icar..309..277B. doi:10.1016/j.icarus.2018.03.012. ^ "Comet Shoemaker–Levy 9 Collision with Jupiter". National Space Science Data Center. February 2005. Retrieved 2008-08-26. ^ "Mystery impact leaves Earth-sized mark on Jupiter". CNN. July 21, 2009. ^ Overbye, Dennis (July 22, 2009). "All Eyepieces on Jupiter After a Big Impact". New York Times. ^ Sayanagi, Kunio M. (3 June 2010). "Jupiter hit by another impactor Thursday". Ars Technica. Archived from the original on 5 June 2010. Retrieved 4 June 2010. ^ Bakich, Michael (4 June 2010). "Another impact on Jupiter". Astronomy Magazine online. Retrieved 4 June 2010. ^ "Jupiter 2019 by Chris Go". ^ Franck Marchis (2012-09-10). "Another fireball on Jupiter?". Cosmic Diary blog. Retrieved 2012-09-11. ^ "SOHO Hotshots". sohowww.nascom.nasa.gov. Retrieved 2019-01-23. ^ "A SOHO and Sungrazing Comet FAQ". home.earthlink.net. Retrieved 2019-01-23. ^ Hubble finds that a bizarre X-shaped intruder is linked to an unseen asteroid collision, www.spacetelescope.org October 13, 2010. ^ mars.nasa.gov. "NASA Mars Weathercam Helps Find Big New Crater". NASA’s Mars Exploration Program. Retrieved 2019-01-23. ^ "NASA Announces Brightest Lunar Explosion Ever Recorded". National Geographic Society Newsroom. 2013-05-17. Retrieved 2019-01-23. ^ Kramer, Miriam; May 22, Space com Staff Writer |; ET, 2013 12:09pm. "Moon Crash Scene Investigation Tonight: See Telescope Views of Meteorite Impact". Space.com. Retrieved 2019-01-23. ^ Mohon, Lee (2017-02-13). "Lunar Impacts". NASA. Retrieved 2019-01-23. ^ Marshall, Spaceflight Center. "List of lunar impact events" (PDF). ^ "Verdens undergang". dfi.dk (in Danish). Danish Film Institute. Retrieved 2011-08-16. ^ Juul Carlsen, Per (May 2011), Neimann, Susanna, ed., "The Only Redeeming Factor is the World Ending", Film (72): 5–8, ISSN 1399-2813, retrieved 2011-05-18. Brown, P. G.; Assink, J. D.; Astiz, L.; Blaauw, R.; Boslough, M. B.; Borovička, J.; Brachet, N.; Brown, D.; Campbell-Brown, M.; Ceranna, L.; Cooke, W.; de Groot-Hedlin, C.; Drob, D. P.; Edwards, W.; Evers, L. G.; Garces, M.; Gill, J.; Hedlin, M.; Kingery, A.; Laske, G.; Le Pichon, A.; Mialle, P.; Moser, D. E.; Saffer, A.; Silber, E.; Smets, P.; Spalding, R. E.; Spurný, P.; Tagliaferri, E.; et al. (2013). "A 500-kiloton airburst over Chelyabinsk and an enhanced hazard from small impactors". Nature. 503 (7475): 238–241. Bibcode:2013Natur.503..238B. doi:10.1038/nature12741. hdl:10125/33201. PMID 24196713. Yau, Kevin; Weissman, Paul; Yeomans, Donald (1994). "Meteorite falls in China and some related human casualty events". Meteoritics. 29 (6): 864–871. Bibcode:1994Metic..29..864Y. doi:10.1111/j.1945-5100.1994.tb01101.x. ISSN 0026-1114.